A WARDROBE STAPLE. 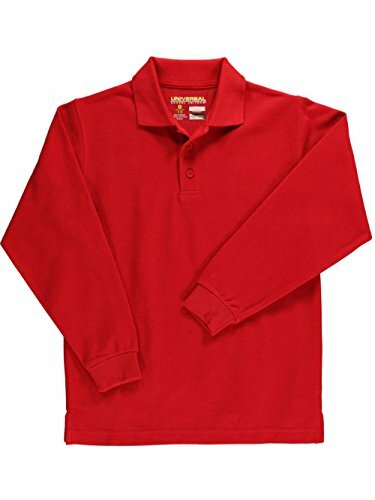 Polos are just so timeless, and so comfortable, and so easy to wear that no child's wardrobe is truly complete without one-or several. SUITS BOTH BOYS AND GIRLS. With unisex tailoring and a wide selection of classic, subdued, and bright colors, it's an ideal option for any child. PERFECTLY PREPPY. Bridging the gap between the too-casual t-shirt and the too-formal dress shirt, this long sleeve polo is an excellent option for wearing to school, to church, to family gatherings, and more. GOES WITH EVERYHING. Whether adding some sophistication to a pair of jeans, toning down dress pants or a skirt, or contributing a bit of extra flair to a sweater, this unisex polo is sure to make a positive impression. GREAT STYLE, GREAT QUALITY. From its stain-resistant material and reinforced stitching on the side seams, to its pique style weave, three button placket, ribbed collar and ribbed cuffs, and vented hem, this polo shirt is designed to look good, wear well, and endure even the most rambunctious of scamps. If you have any questions about this product by Universal School Uniforms, contact us by completing and submitting the form below. If you are looking for a specif part number, please include it with your message.